AMPLIFICATORE/SDOPPIATORE ANTENNA PER LA TV. ANALOGICO E DIGITALE. La tv non riesce ad avere una ricezione perfetta e amplificata dell' immagine?. Con questo amplificatore/sdoppiatore. Per esercitare il diritto di recesso, il consumatore è tenuto a informarci della. 4G TV Filter Signal Network Interference For TV Signal Philex TriStar 19165TR. 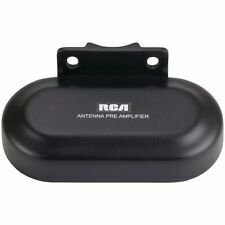 It will extend the range and signal quality of your non-amplified digital HDTV antenna. If you received few Green and Yellow channels, you will need an amplifier. A booster will cause self-oscillate and you may get fewer signals than without. Con questo amplificatore risolverete il vostro problema. Le tv non riescono ad avere una ricezione perfetta e amplificata dell' immagine?. 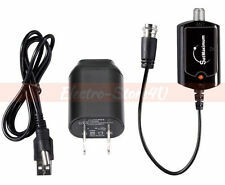 Included 1x Distribution Amplifier, 1x Power Adapter, 1x DC Power Cable, User Manual. Ports 1 input port & 4 output ports. Output 5 Vdc 500 mA. Input 110-20 volts 50/60 Hz 0.3A. Connection Type Type F.
SKU : 006292. Ideal for splitting an aerial signal to 4 TVs, most commonly used with Freeview & SKY boxes as this device allows you to split one (aerial) coax signal to 4 TVs. 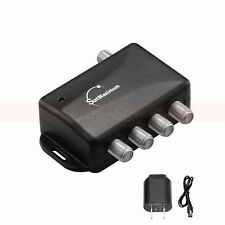 Compact 4-way splitter for wideband UHF/VHF/FM signals. Antenna Distribution Amplifier. Fully shielded construction. 4x TV outlets. Lowest distortions performance available, IEEE 6 kV, B3 surge withstand on all RF ports. low noise amplification. PPC EVO1-9-U/U POWER CABLE SIGNAL BOOSTER WITH POWER SUPPLY NEW!! Mit dem Sperrfilter kann DVB-T wieder uneingeschränkt genutzt werden. - Generation (4G). Die dafür benötigten Frequenzen überlagern teilweise aktuelle DVB-T Frequenzen. Dies verursacht oftmals Störungen. Screw these 12dB attenuator pads in-line with coax cable and reduce signal strength by rated amount. Try different combinations until you get the best picture quality. Use to balance signal strength from different sources. 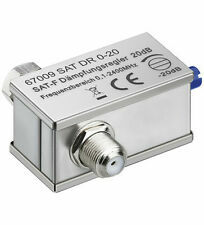 Out of band rejection – >30dB. Fully shielded for minimum signal interference. Easy to install, directly plug in-between signal source and TV via F connector. Get In Touch. DC pass allows power for masthead amplifier. These simply screw into your Virgin feed to reduce the forward channel (Listed as 'Downstream' on the modem/TV box) by the number of dB/Decibels written on the attenuator - Good if you're close to the cabinet or suffering from overpowering. One For All signal boosters couldn’t be easier to use. Built with 1 Output. 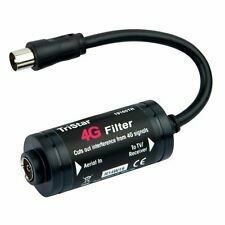 One For All Signal Boosters have a built in 3G/4G LTE block filter to protect your TV/set-top box (STB) against interference from smartphones, tablets and transmitters. Bezeichnung: Sperrfilter. 1 Stück KDG NIF 87-518 N Sperrfilter, wie Abbildung. Typ: KDG NIF 87-518 N. Internet & Phone only, Fernsehbereich wird gesperrt! Die Ware verkaufe ich als gebraucht "wie es ist", daher. EAGLE ASPEN SA-2050 2150 MHz In-Line Amplifier. User Review Item Condition Product Features. BVS 2-01 Basicline. BVS Hausansclussverstärker. Zur Verstärkung der Signale vom Kabelanschluss oder Antennenanlagen (UKW, VHF, UHF bzw. DAB , DVB-T) ohne Rückkanal. Es gibt 1 Jahr Gewährleisung auf die Ware. BVS 2-01 Basicline. BVS Hausansclussverstärker. Zur Verstärkung der Signale vom Kabelanschluss oder Antennenanlagen (UKW, VHF, UHF bzw. DAB , DVB-T) ohne Rückkanal. Es gibt 1 Jahr Gewährleistung auf die Ware. Sat>IP Server HDTV Netzwerk-Anschluss (Ethernet) Stromverbrauch im Betrieb: 36 Watt . Labgear 19114S In-line Metal Variable TV Signal Reducer Attenuator 0 - 20dB. The Inline 10 dB Attenuator Pads has a female and male F type coaxial connection. Female to Male 10 dB Inline Attenuator Pads. We are Summit Source, your Audio/Video Accessory Connection. 22 Gauge Spring Steel Center. VARIABLE GAIN MASTHEAD AMPLIFIER. TETRA REJECTION FILTER ON UHF INPUT. Global TV LINK Professional 4 Way Distribution Amplifier F140. Dispatched with Royal Mail 2nd Class. Radio Shack RF Interference Filter. Pass band: 55-890MHz. Condition: NEW. About This Item. Here is a used Archer Video Stabilizer/RF Modulator Model no. 15-1271. New in box-unused with original box & paperwork including original receipt. COMPACT, LOG-PERIODIC,DIRECTIONAL TV AERIALS THAT ARE IDEAL FOR LOFTS OR AREAS WITH LIMITED SPACE. PRE-ASSEMBLED WITH 'F' FEMALE CONNECTOR FOR COAXIAL CABLE CONNECTION. F-CONNECTOR TWISTS INTO POSITION FOR H OR V POLARITY WITH NO NEED FOR ANY DISASSEMBLY. Screw these attenuator pads in-line with coax cable and reduce signal strength by rated amount. Try different combinations until you get the best picture quality. Use to balance signal strength from different sources. 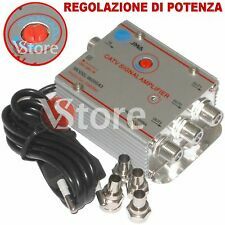 RF Antenna 4 output port Amplifier Splitter for VHF and UHF band. 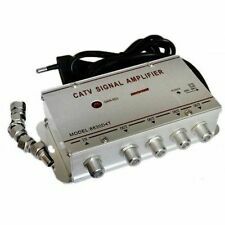 RF 4 output port Antenna Amplifier Splitter for VHF and UHF band. Frequency Range:47-862MHz (VHF & UHF). 1 x Amplifier. Port: 4 outputs. BK SAT Verteiler 6-fach 6 Way Splitter. Hochwertiges Verteilermaterial. Verteiler Typ Dämpfung. Hohes Schirmungsmaß >100 dB durch komplett verlötetes Gehause. 2FV 2-fach 4,5 dB. 3FV 3-fach 7,5 dB. 4FV 4-fach 9,1 dB. Amplificatore da palo di basso guadagno. Fascetta di fissaggio al palo inclusa. - Scatola nera di resistente plastica ABS per l'installazione da esterno. DIRITTO DI RECESSO. - Amplificazione separata per ogni banda. All passive voice modem port. Gas tube surge protection on INPUT port. Nickel plated C360 brass F-ports. Separate inputs for FM, DAB, UHF, CCTV, LNB1 and LNB2. 1x 4 way Distribution. All outputs IR enabled - 9V 15mA with short circuit protection. Minimal insertion loss. The PCT-MA2-8PN distribution amplifier will boost your digital TV and HDTV signals, increasing their overall signal strength. They have a miniature design which will give you more space to relieve congested installs when space is at a premium. BK SAT Verteiler 4-fach 4 Way Splitter. Hochwertiges Verteilermaterial. Verteiler Typ Dämpfung. Hohes Schirmungsmaß >100 dB durch komplett verlötetes Gehause. 2FV 2-fach 4,5 dB. 3FV 3-fach 7,5 dB. 4FV 4-fach 9,1 dB. Inverto IDLP-QTL410 Premium Quattro. IDLP-QTL410 Premium Quattro. Prezzi competitivi. Prodotti 100% originali, nuovi di zecca - eeemarket non vende prodotti usati o contraffatti - MAI! Descrizioni precise dei prodotti. Optimized performance in the MoCA band in "MM", "MF", and "MV" models. Exceeds all SCTE standards. 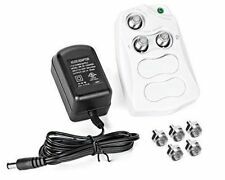 Self-resetting short circuit protected power adaptor local or remote powering. Commscope Power Inserter. One power inserter is required if the amplifier allows DC power on the RF output and you are not using a splitter or you are using a power passing splitter. If you are installing your cable TV amplifier outside or in a location without a power outlet, you can run your power on an existing wire with RF signal.